Ready to clear the path? Set Intentions for a new year and a new you? will call forth a new Wisdom Code™ in alignment with your 2019 Intentions and anchor those intentions into your being. a sacred bundle with your intentions. We will release what is holding us back from receiving the items on our intention list and then take a magical journey into the depth of the Divine Mother’s womb to rebirth ourselves with the energy of the new born Sun. During the Meditation you will be guided on a magical journey to reclaim your own inner light and set the stage for 2019! We will energetically charged a small glass of water you’re your new Wisdom Code and intentions for your journey! POWERFUL! 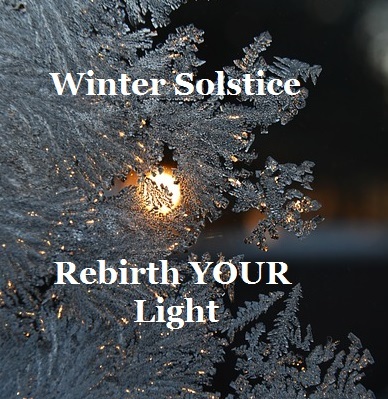 Winter Solstice – great magic and the power to truly start the new year will be encoded into the recording. journey as we move into the new year. What if you started your next step with clarity and the magic of the Goddess along with her loving energy supporting your heart’s desire? 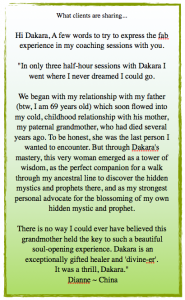 DaKara, I have been trying to heal sexual abuse and have been pulling cards about forgiveness. Doing healings myself, I covered a lot of areas but was still “stuck” in figuring out what it is I needed to forgive. being offered. This is huge for me. it was also interesting when you asked me about what gift, my body tensed up because I didn’t want anything but more emotional than tangible item. Love was bought in our family and my ex-husband does the same with my daughter. I wanted more of my emotional needs to be met since my parents were never home but working. I also figured out that the statement of parental attention was a pattern that my mother needed also and didn’t get. So really, it becomes easier to forgive her because she is somewhat unequipped to offer something she has not experienced and understood. I understood and was more maternal with my daughter and have an incredible bond with her but it is so much more complicated than what we see…. I tried to not have any expectation so that way I am ready to receive what it is I need to receive. Sincerely, I didn’t know what to expect and I am so grateful. I had a big aha moment and was glad I actually got to connect with you directly. I know what I need to do next and that is very helpful. It was also interesting when you were talking about the gatekeepers, I saw trolls – you mentioned gremlins – and I saw several – and for me it was the main gatekeeper as protection but those creatures were instigate sabotage. THANK YOU SO MUCH, WISHING YOU THE MOST AMAZING YEAR YET!! likely why I kept falling asleep initially. The enlightenment, healing and transformation was absolutely profound for me. Words cannot express how beautiful your work is and how blessed I feel to have be part of it. Much Gratitude to you, Dakara. I started out @ a 10/1/0 and reduced to 0 so I was very happy with the outcome. I was working on a relationship to bring in my soul mate. The water was like an elixir, Like. treacle, soft and smooth.